l-Make sure you have a gambling talisman, pray over the talisman, anoint with oil. 2-Pass over your incense while it is burning to recharge. 3-It is important to use a CASINO KIT, before you go to gamble. 4-Anoint your hands front and back, with the talisman before you go thru the Casino door. Vision the money you want to bring home...see it in your hand. SONNY BOY® says, always use a kit for strongest action. Use Sonny Boy Glass Jar 7-Day Candle, Sonny Boy Anoint Oil, Sonny Boy Incense Sonny Boy Bath Wash, Sonny Boy Salt Crystals or Sprinkling Sand, or Sonny Boy Anoint Spray. SONNY BOY® Lucky Gambler spiritual and religious faith oils, incense, bath wash, salt crystals, sprinkling sand, bar soap, spray and spiritual faith glass jar candles. GAMBLERS LUCKY HAND Activate Your Lucky Hand Win Anytime...Anywhere! Touch the palm of your LUCKY HAND with a talisman which is anointed. Then put your hand in the pocket where you keep your money, say the amount you need to draw. Powerful at CASINO, ARCADE, Bingo, Lottery, PAY ME! SONNY BOY says, always use a kit for strongest action. Use Sonny Boy Glass Jar 7-Day Candle, Sonny Boy Anoint Oil, Sonny Boy Incense Sonny Boy Bath Wash, Sonny Boy Salt Crystals or Sprinkling Sand, or Sonny Boy Anoint Spray. l-Write B I N G O and the amount you need to bring home on a white paper. 2-Tie in a knot in one end of the cloth with a nutmeg, or other gambling talisman charm with a $1 bill. 3-Wipe both hands with the cloth before going thru the door. 4-Vision your money in your hand. 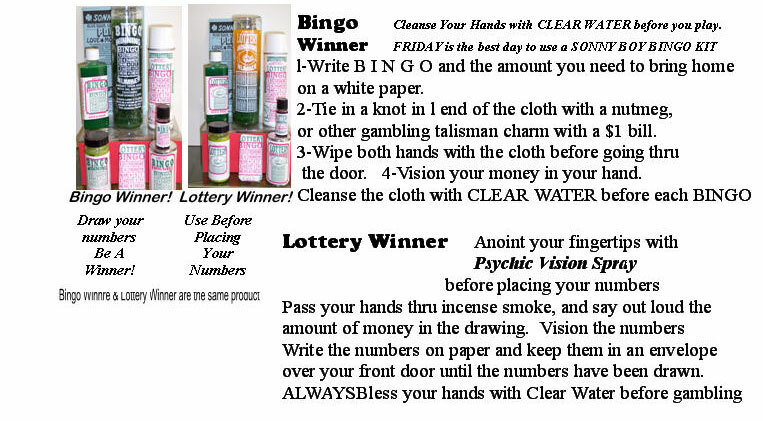 Cleanse the cloth with CLEAR WATER before each BINGO game. SONNY BOY says, always use a kit for strongest action. Use Sonny Boy Glass Jar 7-Day Candle, Sonny Boy Anoint Oil, Sonny Boy Incense Sonny Boy Bath Wash, Sonny Boy Salt Crystals or Sprinkling Sand, or Sonny Boy Anoint Spray. 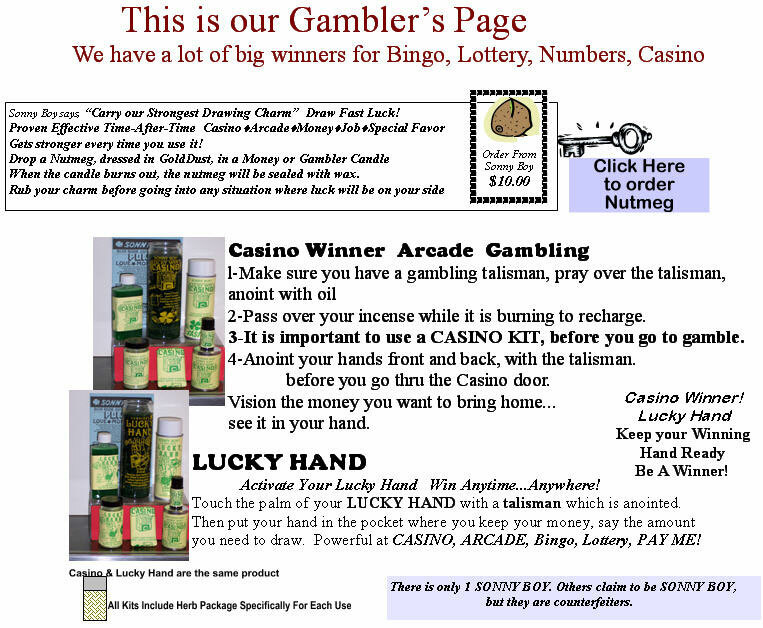 SONNY BOY® Gambler Lottery Winner spiritual and religious faith oils, incense, bath wash, salt crystals, sprinkling sand, bar soap, spray and spiritual faith glass jar candles. SONNY BOY says, always use a kit for strongest action. Use Sonny Boy Glass Jar 7-Day Candle, Sonny Boy Anoint Oil, Sonny Boy Incense Sonny Boy Bath Wash, Sonny Boy Salt Crystals or Sprinkling Sand, or Sonny Boy Anoint Spray, GAMBLERS Lottery Winner	Anoint your fingertips with Psychic Vision Spray before placing your numbers. Pass your hands thru incense smoke, and say out loud the amount of money in the drawing. Vision the numbers. Write the numbers on paper and keep them in an envelope over your front door until the numbers have been drawn. ALWAYS Bless your hands with Clear Water before gambling. 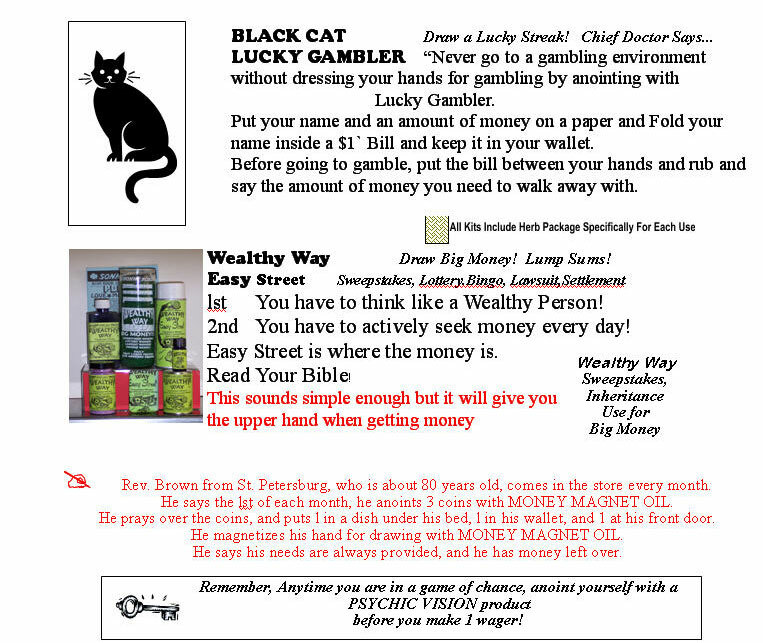 SONNY BOY® Lucky Gambler Black Cat spiritual and religious faith oils, incense, bath wash, salt crystals, sprinkling sand, bar soap, spray and spiritual faith glass jar candles. Lucky BLACK CAT Drawing Power- Draw a Lucky Streak! Chief Doctor Says...LUCKY GAMBLER	"Never go to a gambling environment without dressing your hands for gambling by anointing with Lucky Gambler Oil." Put your name and an amount of money on a paper and fold your name inside a $1 Bill and keep it in your wallet. Before going to gamble, put the bill between your hands and rub and say the amount of money you need to walk away with. I especially like the spray. SONNY BOY says, always use a kit for strongest action. Use Sonny Boy Glass Jar 7-Day Candle, Sonny Boy Anoint Oil, Sonny Boy Incense Sonny Boy Bath Wash, Sonny Boy Salt Crystals or Sprinkling Sand, or Sonny Boy Anoint Spray. lst -You have to think like a Wealthy Person! 2nd -You have to actively seek money every day! Sonny Boy spiritual products provide the extra edge you will need in gambling, games of chance. Sonny Boy says, "prepare yourself for opportunity". Sonny Boy Bingo and Lottery items work for thousands every day. Don't let that opportunity pass you by. Sonny Boy Casino and Lucky Black Cat items are a must have. Use these products before you go to gamble, and use them while you gamble. Power is Luck! Make yourself Lucky! Sonny Boy Wealthy Way can bring you money from anywhere; inheritance, court cases, high position.